Separate dough from 1 can (16.3 oz) Pillsbury™ Grands!™ Flaky Layers refrigerated biscuits into 8 biscuits. Cut a slit in side of each biscuit to form a deep pocket. 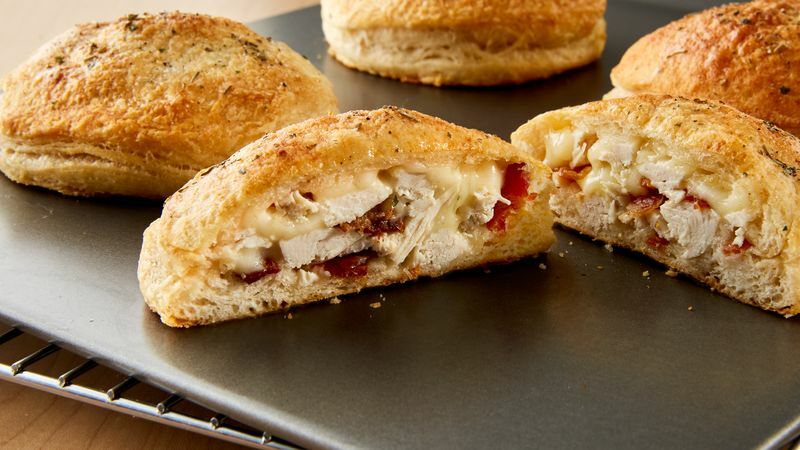 Stuff each biscuit pocket with 2 tablespoons shredded cooked chicken breast, 1 tablespoon chopped cooked bacon and 1 slice (1/2 oz) mozzarella cheese. Press dough back over filling, sealing edge of each biscuit; place on ungreased large cookie sheet. Brush 1/4 cup melted butter over all stuffed biscuits. Sprinkle 2 tablespoons dry ranch dressing and seasoning mix over tops of stuffed biscuits. Bake 20 minutes or until golden brown. Serve immediately. Plan ahead. This recipe calls for cooked chicken and bacon! Try using Cheddar cheese instead of mozzarella for extra sharp flavor! Garnish with ranch dressing and chopped fresh chives, if desired.